Do you want to quit tobacco or help someone else to? If that’s the case, you’ve made one of the best decisions of your life. Download our virtual therapist app and give up smoking now! The Pro version of Stop Tabaco Mobile Trainer costs about the same as a packet of cigarettes. Think about it… the investment is minimal and the benefits to your health when you quit smoking have no price. This is a serious programme to help you give up smoking, endorsed by the Official College of Psychologists (COPLP) and developed in collaboration with the University of Las Palmas de Gran Canaria with a success rate of over 80%. With our programme, you’ll gradually give up smoking in a controlled way thanks to the help of a Virtual Therapist who will accompany you in the different stages of treatment: initial evaluation, daily tasks, D Day and the days following quitting. Stop Tabaco Mobile Trainer is a new way of helping smokers who want to give up their habit and there’s no other programme like it. It deals with the components of cognition, emotion and habit that maintain your addiction. Hundreds of patients have already given up smoking with our programme. If they can do it, YOU CAN TOO! 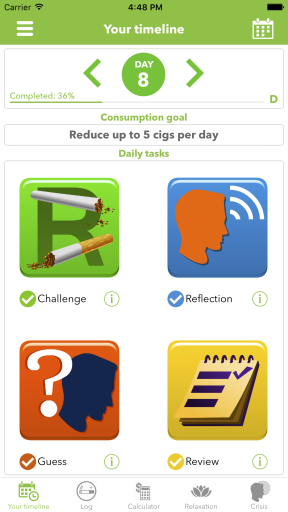 Stop Tobacco Mobile Trainer Pro walks you through the process to quit smoking forever. Before the program can even begin, the app starts with an evaluation to make sure you are ready to quit. Introduce yourself by adding your name so the trainer will know how to address you. Answer questions like, how much do you really want to quit? Could you be a non-smoker within 6 months? After the short quiz, your score will determine if you have enough determination to move on. Choose one of three personal therapists to help you through your journey. Every day after you will complete 5 tasks; log, challenge, reflections and myths, guess and final review. More evaluations will determine how strong your addiction is and what is likely to trigger it. Like logging food when you are trying to lose weight, each day you will log the cigarettes you smoke in the app, right before you smoke them. Read your Challenge of the Day to help with behavioral change and use the Reflection and Myths area to help with reasoning. The guessing part is to test a quitter’s knowledge on smoking and it’s effects, fighting the habit by educating the user more about the habit they are trying to quit. The final review is done before bed, go over your achievements and challenges of the day. The logging and reviewing keeps you on top of the habit so you can continue evaluating and eventually stop. Stop Tobacco also includes a relaxation area that teaches techniques to help with cravings and anxiety issues that can crop up during the quitting process. By tackling the addiction at a psychological and physical level, the chances are good this app will help you to quit. Stop Tobacco Mobile Trainer Pro is well worth the money for anyone looking to finally cut out this dangerous habit. With the endorsements and research behind it, along with and 80% success rate, you really have nothing to lose, except for the habit. The app is universal for iPhone and iPad and includes Apple Watch compatibility. It is available now in the App Store for only $4.99. Visit their website stop-tobacco.com for more information.